Pat Solum retired at the end of last month after 34 years and 11 months as the lab manager for the Paynesville Area Hospital, having begun working there in 1971 in a 15 foot by 15 foot room with a card table for a desk. When she agreed to manage a team of two in the Paynesville Community Hospital laboratory, Pat Solum expected to only work there a short while before moving to a bigger facility. "The first year, I thought, 'I'll go next year,' then eventually I never had a thought about leaving," she remembered. Now, reflecting on her 34 years and 11 months as the lab manager for what is now the Paynesville Area Hospital, Solum realized, "I did get into a bigger facility, but I got to stay right where I was." At the end of July, Pat Solum retired after managing the lab for the Paynesville Area Hospital for 34 years and 11 months, starting in 1971. Shown here with Tami Stanger, now the interim lab manager, Solum helped the lab expand and, because of that, realized her dream of working in a large facility without leaving PAHCS. The three-member staff that included herself and two other employees - who took turns between the laboratory and the x-ray department - back in 1971 grew to a group of 17. The 15 foot by 15 foot lab grew into larger rooms twice and now includes labs in PAHCS' satellite clinics. And the card table Solum used as her first desk transformed to a real desk long before her last workday, on Friday, July 28. It has been "very satisfying for me" to work in Paynesville, said Solum, who grew up on a farm near New London and attended the University of Minnesota, Twin Cities, for her degree before working there in the university lab. Research, sales positions in instrument companies, technical work in manufacturing companies, and teaching were all open to her with her degree, said Solum. "It doesn't have to end in a laboratory, unless you want it to end there," but that is exactly where she wanted it to end. Working in the same position for so long - she has managed the lab for the nearly 35 years that she has worked there - has not been a cause of boredom, though. Changes have been abundant in her time with the hospital. As the lab and its staff grew, the technology it used changed dramatically, as well. "Each new instrument is exciting in the lab," said Solum, who has been there to see it expand. "Year by year, we started to get more equipment," said Solum, and in 1996, the laboratory started storing information electronically. It was the first information system in the hospital for patient care data and was a big change. "At that time," noted Solum, "a lot of the employees had never touched a computer." An automated bacteria identification machine was acquired this past February, and Solum is proud that overall "we have very modern equipment." The laboratory provides testing that most rural clinics wouldn't offer, like thyroid and tumor marker testing. Much of the less involved testing is completed entirely at the satellite clinics, and samples are taken by courier twice daily between the labs. In fact, the Paynesville laboratory is so advanced that sales representatives from Abott Northwestern refer to it as the "mini Mayo," said Solum with a smile. It's a far cry from the small space that she started in, where she had patients sit in her own chair at her card-table desk in order to draw their blood. Expansion like that meant that Solum "never felt stifled because I came to a rural hospital." By being in Paynesville, she's been able to work in a state-of-the-art facility and to "learn the patient picture" in a way that employees of larger labs never do, she mentioned. She can see different samples from patients and fit them together, she said, seeing "the patient's being with the results." Solum has taken on other positions while still managing the lab, too. She managed the radiology department for four or five years and has been the chairperson of the infection control committee since it was begun more than a quarter century ago. She even purchased the first CT scanner at the hospital - the first in a small facility anywhere in Minnesota - something she called an unusual task for a medical technologist. She has also trained lab employees, sharing advice like this: "Respect your coworkers and conscientiously do your work. If you remember that the patient is why you're here, everything else that needs to happen will happen." The first lab Pat Solum worked in at the Paynesville Community Hospital was only a 15-foot square, with limited equipment. 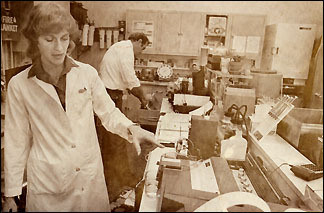 Here, she is shown working after five or six of her eventual 34 years in the lab. "I absolutely love my job," commented Solum, who has not been waiting anxiously to reach retirement age. With a mixture of emotions, she is leaving the position where she met her husband of 12 years, Dr. Allan Solum. Other hospital staff have joked that he is her "best souvenir" from the past three and a half decades, and Solum won't deny that, though she takes with her many other memories. Being with coworkers and watching their families grow up has been a joy for Solum. At work and outside of work, they enjoy each others' company, and Solum especially treasured memories of laboratory staff Christmas parties. Lab staff members also dress up for Halloween, and one year, Solum was Cruella De Vil and the other employees were dalmatians. Over her years there, Solum is glad to have become "very close to the whole facility, to the whole staff." Many firsts occurred for her as a member of the hospital staff. While she was training in California, she drove in Los Angeles, which she called "a big thing." Something even bigger, though, was having her children at the hospital where she worked. Solum has two children and three step-children, with eight grandchildren. Most are out of state, but now that she's retired, she is taking two weeks in Oregon to visit her daughter, "just to catch my breath," she said with anticipation. Staying involved with the Paynesville Lutheran Church, whose members she considers "another one of my families," and perhaps finding a part-time career later will keep her busy, said Solum. She will catch up on hobbies, as well, like reading, walking, boating, doing yardwork, and playing golf and tennis. That will help keep her from missing the lab she worked at for so long. Solum knows that most people do not stay in one position for such a length of time but said that her "science orientation" kept her in a medical field. That is something that runs in her blood, because in a family of eight, she and her siblings include two medical technologists, an RN, and a dietician who is also a counselor. Then, when the in-laws are considered, there are more lab workers and nurses, plus a physician. "We are a nightmare if someone in the family is sick," laughed Solum, because they barrage the medical staff with questions. Tami Stanger, with whom Solum has worked for a number of years, is now the interim lab manager. Solum, who witnessed so many changes in the hospital lab over the past 34 years, just caused one of the biggest. That change is simply that, after so many years, the lab has a new manager.